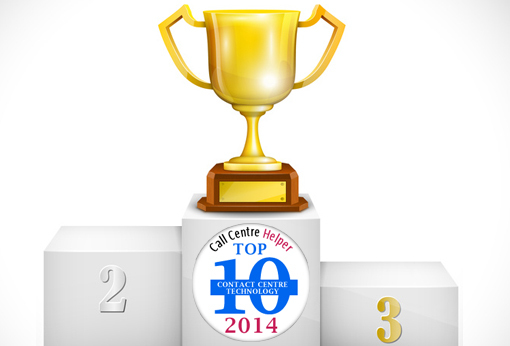 Here are the results of the 2014 Top 10 Contact Centre Technology Awards. Here are our most recent award winners. Thanks to the 330 people who voted. 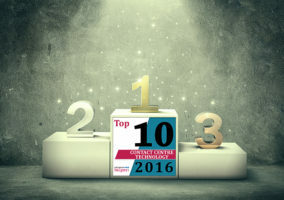 It makes these the most impartial of all the contact centre technology awards. Brief overview of product: intelligentContact incorporates all the ingredients of traditional contact centre solutions, e.g. ACD, IVR, call recording, skills based routing, reporting and workforce optimisation, along with customer service CRM modules and Unified Agent desktop to create a unique Customer Engagement solution. Available both on premise or as a cloud solution intelligentContact provides a Multi-Channel Contact Centre solution for voice, email, text, chat, mobile apps and social and is designed to integrate existing telephony and technology. What about the product is innovative, interesting or different? intelligentContact provides a simple, intuitive agent interface which brings together not only interactions from across all channels but also customer data from all front and back office systems and applications: guiding agents through transactions and managing workflow. What really distinguishes this from other desktop solutions is the ability for non-technical staff to quickly and easily customise and modify the desktop to optimise agent performance and improve the customer experience. Release details: The latest release of intelligentcontact enables significant advances in user-configurability, giving organisations the ability to customise and modify their own desktops in line with individual and changing requirements. For some this might involve broadening channels to include social, mobile, chat and email, while other businesses may want to change the type of data from trouble-ticketing systems or back-office sources that is presented to the agent. Typical customers: Ford Retail, Balfour Beatty Workplace, Babcock International, Aviva, Fitness First, OVO Energy, Iceland, Aldi, Which? Typical price for a 100 agent solution: Prices start from £40 per agent per month for voice only, up to £100 per agent per month for full multi-media & Agent Desktop. Even the basic voice price includes full CTI, IVR & Voice recording as standard. Brief overview of product: Increasingly mobile and social customers demand changes in the way brands interact with them. Consumers now shift frequently between channels and expect brands to be able to track their comments and conversations and respond accordingly. LiveOps Engage addresses this phenomenon. LiveOps Engage is a web-based multi-channel cloud contact centre application. It’s easy-to-use agent desktop allows customer interaction via voice, web chat, email, SMS, Facebook and Twitter. LiveOps Engage supports all channels in a single browser application, replacing individual channel solutions and their, often complex, integrations. Agents have a consistent interface and no longer need to login to multiple applications and “ALT TAB” to other screens. This alleviates inconsistent service across channels and slow customer response times. Agents can ‘pivot’ from one contact channel to another during a single interaction – for example, from a public Twitter conversation to a voice call to resolve a customer issue. All interaction history for calls, chat, email, social and SMS are stored in one place and available to inform an agent during subsequent interactions. Intelligent ‘universal contact queue’ routing functions allow you to define priorities based on agent skill, contracted service levels, tiered customers, and agent performance. Call back options provide further queue management flexibility. LiveOps Engage includes standard connectors to CRM leaders such as Salesforce, Microsoft Dynamics and Zendesk allowing existing customer/account/case information to be stored in one place. Sophisticated voice features provide full voice control and screen popping. LiveOps Engage also supports an industry-standard WebRTC-enabled softphone embedded within the browser application. This removes the reliance on traditional telephony equipment on the agent desktop. A comprehensive API suite enables highly flexible and configurable contact centre platform. To expand the platform capability, we have technology partnerships with vendors such as Verint, NICE, AdTech, Twilio and MindTouch. Release details: LiveOps Engage came to market in Jan 2013. LiveOps acquired the multi-channel contact centre application specialist, Datasquirt, in 2012: LiveOps Engage is the next generation agent desktop release following the integration of Datasquirt. Approx. number of UK customers using the product: Nearly 1,000 agents are using LiveOps Engage in the UK, with the following sectors represented: outsourcing, finance, not-for-profit, technology, B2B services, travel and housing associations. Typical customers: Organisations looking to add new interaction channels such as Twitter and web chat want an integrated solution rather than point solutions. Brief overview of product: Jabra BIZ 2400 Included as standard in this award-winning audio device are the following 10x features that has raised the bar for contact centre audio technology and make the Jabra BIZ 2400 the leading corded headset for the contact centre. The innovation within the Jabra BIZ 2400 is within the better audio, better build, better comfort areas of the product – all of which are vital for contact centres. Providing a headset that features state-of-the-art noise-cancelling microphones and speakers ensures the agent can heard and be clearly, avoiding repetition in conversations and supporting quicker call wrap up times. It also ensures the device upholds health and safety requirements and protects the agents hearing. Using the most robust materials in a cost-effective way allowed Jabra to incorporate a break-proof boom-arm, Kevlar reinforced cord and surgical steel parts into the Jabra BIZ 2400, to give it the better build tag. We know that contact centre headsets take a daily punishment of wear and tear and by including these hard-wearing materials, we can protect the investment made in this device to ensure it can handle daily use over a number of years. This product also comes with a 3-years manufacturer’s warranty. The first year of production return rate for breakages on the Jabra BIZ 2400 of 0.1 on the first 100,000 sold also shows that we produce products that live up to expectations. The all-day comfort of supersoft ear cushions and variety of wearing styles ensures that the agent can happily wear this headset all-day every day without any issues. Happy agents = happy customers so ensuring the agent is comfortable, can hear clearly and is using a device that is built to last all help to support KPI achievement and targets. Typical customers: Large seat in-house contact centres and a mix of contact centre and office workers. Typical price for a 100 agent solution: £95 approximately dependent upon number purchased. Brief overview of product: injixo is a cloud platform offering state-of-the-art workforce management (WFM) solutions for contact centre professionals. injixo is powered by InVision, a tier-one developer of sophisticated WFM solutions since 1995.
injixo WFM provides comprehensive support for the whole WFM cycle, enabling call centres optimally to schedule their employees to match ‘supply and demand’ and thus consistently achieve service goals at lowest cost. It also provides all the functionality you need for intraday management, adherence monitoring and reporting. injixo Forecast is an always-on, self-learning forecasting engine, providing forecasts that are always up-to-date. The solution automatically processes vast amounts of historic data as well as current, newly imported data that are constantly collected by the system in real time and thus delivers extremely high forecast accuracy with minimal effort. injixo Act empowers call centre supervisors to monitor and manage service level and other KPIs throughout the day – on a computer, smartphone or tablet PC. The application displays day-so-far service level and forecasts expected service level, enabling supervisors to take corrective action in a timely fashion. injixo Me helps agents to organise their shifts and schedules. The agent portal enables agents to view their shifts, request holidays, swap shifts, bid for shifts and more. It supports mobile devices such as iPhone, iPad and Android devices, enabling agents to manage their schedules anytime and anywhere. It integrates with the agent’s mobile calendar and generates reminders, thus assisting agents to adhere to schedule even when away from their seats. injixo Learn provides online training programmes for injixo WFM users, as well as a wide range of on-demand e-learning courses from The Call Center School to fit the needs of personnel in all roles in the contact centre. injixo Community is a free service for all injixo users providing a social platform to interact with your industry peers and expand your professional network. Release details: injixo WFM, injixo Learn and injixo Community were launched in April 2011. injixo Forecast and injixo Me were launched in September 2013. injixo Act was launched in December 2013. Approx. number of UK customers using the product: January 2014: Already 25+ customers in UK, 80+ world-wide and more signing up each month. Typical customers: Call centres and contact centres of all sizes and in all industries. Typical price for a 100 agent solution: Subscription fee for 100 agents is £900 per month. Brief overview of product: Real time performance software for customer service operations, combining voice of customer, productivity monitoring and employee engagement. Clients get an industry first holistic view of the key areas that need to be monitored and managed to deliver world class customer service, yet at a reasonable cost. On average it increases customer satisfaction and NPS scores by 20%. Instant customer feedback – Customers are surveyed 10 seconds after their call or email. The results are fed back both to advisors (creating a self-correcting solution) and other departments (decreasing complaints calls into the contact centres). Productivity metrics – Enabling companies to find the true best advisors that are both productive and generate good C-SAT and NPS scores. Employee engagement – Measured and benchmarked giving the clients actionable feedback on how to drive engagement and where. Clients particularly like: the accountability that results broken down to advisor level creates, the ability to convert customer verbatim into text and data mine them and, correlation features showing them what the real drivers of customer satisfaction. Typical Customers: Argos, Asos, Barclays, Coventry BS, Domestic & General, John Lewis, Littlewoods, RBS, South Staffs Water, Which, Zipcar. Typical price for a 100 agent solution: £1,800 per month. The solution provides a multi-layered approach by combining cutting edge voice biometrics, with Context and Telephony Analytics, Transaction Analytics and NICE Real-Time Decisioning and Guidance. Real Time Decisioning and Guidance guides the agent through knowledge-based authentication with dynamic security questions and provides optional referral policies. The system automatically notifies the agent whether the caller has been positively identified or whether the agent should proceed with further authentication measures. Release details: Product Generally Available. Approx. number of UK customers using the product: First customers going live. Brief overview of product: Plantronics’ SAVI 700 wireless headsets are aimed at productivity-focused call centre professionals who want to effectively manage their office communications using intelligent technologies. The SAVI 710 and 720 are specifically designed to let call centre employees seamlessly connect their headsets to their desk phones, PCs, and mobile phones and use these within range of up to 350 feet. The SAVI 700 series’ Three-Way Connectivity feature allows users to easily switch and mix audio between their desk phones, PCs and mobile phones using one intelligent, wireless headset system. With this feature, call centre professionals can benefit from best-in-class sound quality when engaged in business communications on any of their connected devices. Just as importantly, employees will be able to serve customers more efficiently and offer them a consistent level of service when contacted on any of their connected devices. With one-touch call answer/end, volume adjustment, mute, and flash options, employees can manage their calls from any connected device up to 350 feet from the charging base. This gives them the flexibility to step far away from their desks if required to better serve their customers without having to put them on hold or end a call. To add to this, SAVI 700 headsets can automatically route incoming calls to a user’s mobile phone or headset, depending on which of these is within easier reach. This functionality works both ways, as users can also transfer audio back from the headset to their mobile phones with the press of a button and take a call on the move with no interruptions. Armed with these capabilities, call centre employees can always rest assured that customers can contact them, and that they in turn can continue to serve callers even if they need to move around the office or work on the road. Approx. number of UK customers using the product: There are over 200 businesses currently using Plantronics SAVI 700 wireless headsets. Typical customers: Eurostar International, Goodyear Dunlop, and InterCall Europe. Brief overview of product: The Genesys Digital Customer Service Solution enables companies to view customer interactions as customers see them, as a single dialogue between one customer and one organisation. The Genesys Digital Customer Service solution provides full insight into the customer’s journey across all channels, enabling the best action for the customer to be determined on the context of the conversation. The Genesys Digital Customer Service Solution empowers contact centre agents to see customer interactions as a single conversation over multiple channels, and meet customers on whatever channel they want to use to provide a consistent, efficient experience. Release details: Genesys has been providing solutions to the contact centre market for over twenty years. The first Digital Customer Service options were released over 10 years ago. Capabilities have been added steadily since then. In recent years: 2011 – Social Media Engagement 2012 – Mobile Engagement 2013 – Proactive Web Engagement, Co-Browse, WebRTC All of which are currently either deployed and generating business value, or being deployed to customers. Approx. number of UK customers using the product: There are currently over 30 customers in the UK currently using various flavours of the Digital Customer Service solution. 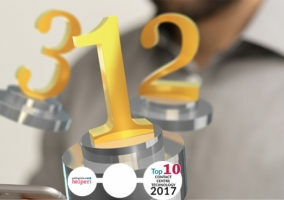 Typical customers: Customers of the Genesys Digital Customer Service solution range across all industries including retail, financial services, telecommunications service providers and utilities. Telecommunications providers tend to be interested in social media mobile capabilities. Banking organizations are often interested in mobile capabilities, web chat, secure email, etc. Retail organisations typically interested in Proactive Web Engagement capabilities, and cross channel sales and marketing capabilities. Typical price for a 100 agent solution: Prices vary for different levels of solution capabilities. Brief overview of product: eg operational intelligence software suite is the most complete, purpose built Back-Office WFO suite with more ‘out of the box’ functionality than any other product. Businesses can use our software straight away, leading to an immediate impact on their back office performance and a quicker return on investment. The software provides historic, real-time and predictive Management Information about all the factors affecting operational performance. It enables Managers and Team Leaders to make the right operational decisions to effectively measure, manage and improve business operations. Approx. number of UK customers using the product: 30,000 user across 35 clients based in the UK. Typical customers: Blue-chip organization in the financial services and Utilities sector such as npower, L&G, Nationwide, West Brom, Santander and Capita. Brief overview of product: ContactWorld for Service is a true cloud contact centre solution which enables businesses of all sizes to deliver a personalised and unique customer experience, quickly and securely. Customer service is the lifeblood of any organisation and with ContactWorld for Service, you can deliver an excellent customer service experience. The solution offers the industry an alternative to traditional vendors who ‘lock in’ call centre operators with expensive on-premise equipment which is inflexible and expensive. By comparison, ContactWorld for Service can easily meet operators’ changing needs, flexibly and cost-effectively. NewVoiceMedia is based in the UK, with turnover growing at more than 60% per annum and new operations in the US, EMEA and APAC. NewVoiceMedia offers a true cloud contact centre solution with no need for downloads/plug-ins or expensive integration with on-premise equipment, unlike other so-called cloud contact centre platforms. NewVoiceMedia provides a per-user global subscription service at a fraction of the cost of on-premise equipment. It is easy for clients to set-up and control, without the need for new hardware or expensive IT resource for number set-up, routing calls, and ongoing management. Multi-channel integration, including social media – Handling calls, emails, web-chat and feeds from social media, such as Facebook and Twitter, is integrated into the NewVoiceMedia platform. Sophisticated call routing saves time – Customers can route calls to the best agents based on: caller line identification, country of origin, number called, case number, language spoken or customer choice through IVR menu systems. Salesforce integration drives efficiency – Time savings for agents is maximised with salesforce.com integration. Advisors receive ‘Whispers’ and screen pops to the customer’s CRM record that make call handling faster. As does ‘click to call’ functionality. ContactWorld is always up-to-date, with two week feature drops, giving access to the latest version of the software. For example, workforce management and end of call customer satisfaction functionality has recently been added to the product suite for ContactWorld customers. Release details: ContactWorld for Service was launched in 2006 and has a customer retention rate of 97%. Approx. number of UK customers using the product: Approximately 180 businesses in the UK, ranging from 14 seats to 600. Typical customers: NewVoiceMedia has 250+ customers in 40 countries on five continents covering most industry sectors. Customers include PhotoBox, DPD, Lumesse, QlikTech, Cunningham Lyndsey and Topcon Positioning Systems. Typical price for a 100 agent solution: Typically, NewVoiceMedia is 50% cheaper than an alternative on-premise solution, but the full cost depends on the call plan, Apps and features selected by customers. Brief overview of product: ISV FastPath is an online skills testing and training program. It consists of a comprehensive library of over 200 exercises; perfect for recruiting the best staff into contact centres and developing their skills. Alongside existing material contact centres can build their own tailored assessments using the Question Builder function. This is very popular not just with recruitment but for confirming their learning after inductions. We also offer branding of our system with company logo and colour schemes. Release details: The core of the program was first released in 1992, it has been updated annually ever since. Approx. number of UK customers using the product: Approximately 800 companies. Typical customers: Contact Centres doing large recruitment drives. Customers include AA Insurance, Ageus Insurance, Lycatel and Neopost. Typical price for a 100 agent solution: Candidate token £1200, 300 candidates or less £3200. Brief overview of product: The Customer Interaction Center (CIC) enables contact centres to provide a holistic, efficient service experience to its customers through a highly personalised approach. CIC is a multi-channel software platform that integrates with existing business systems to ensure the availability of real-time and historical information to agents to ensure seamless customer interactions. The platform is available in the cloud or on-premise and features powerful IP communication capabilities, unified communications, and automated multimedia queuing and routing. CIC has the capabilities to elevate service levels and customer satisfaction, and ensure the most effective and efficient use of resources, including agents, while optimising productivity. The platform is extremely versatile in terms of what functionality can be added to it – including predictive dialling, speech recognition, voice analytics and multi-site call routing. In addition, the CIC can be deployed in the cloud or on-premise. Typical customers: Our customers include those in the outsourcing, retail, and the financial services industries. Typical price for a 100 agent solution: It is difficult to attach a price as it is entirely dependent on what functionality is required. Brief overview of product: Aspect Unified IP is a complete, software-based, unified platform for customer contact that delivers reliable performance in a highly available and scalable architecture. The solution simplifies and flexibly manages interactions, producing operational efficiencies and cost savings. At the same time, it minimises customer effort, providing a differentiated multichannel, multichoice customer experience across voice, email, web chat, IM and SMS. Aspect Unified IP enables organisations to do business at the speed of the consumer, minimising customer effort. It provides an omnichannel environment in which the customer can interact thorugh their chosen channels, with seamless integration between all channels. As a Microsoft strategic partner, Aspect has the ability to unify both multichannel communications and effective people management with Microsoft Sharepoint, Dynamics CRM and Lync. Release details: Aspect Unified IP 7.2 was released in June 2013, across all regions. Typical customers: Financial services providers, Outsourcers, Utilities providers, telcos and travel companies. Typical price for a 100 agent solution: Pricing for 50-500 agent call centres range from $1,100 – $1,700 per agent. Brief overview of product: Organisations who need to transform their peak period customer engagement will value this automated outbound call functionality that provides a managed response to inbound multichannel requests. Contact centres deliver seamless queue management and answer website contact requests without increasing headcount. QueueBuster uses innovative patented agent first callback to significantly improve customer service while smoothing peak contact requirements. Contacts from queues and web enquiries are spread into a steady stream of traffic, enabling the contact centre to manage peaks without increasing headcount costs. The queues can be skill-based, so contacts can automatically be fed to agents with multichannel capabilities or to an especially skilled team as required. QueueBuster ensures that only when the agent is available is the callback invoked. This unique and patented process ensures that customers always answer the phone to an informed agent, thus avoiding reputational damage or the danger of silent calls. Organisations increase online sales conversion rates, while offering browsers a tailored experience, resulting in satisfaction and reducing browser abandonment. Contact centres handle up to 15% more contacts and reduce talk time with easier conversations and fewer complaints, while meeting Service Level Agreement targets (SLA) – honestly and reliably. Typical price for a 100 agent solution: This is available as a cloud-based solution or on-premise installation. The competitively priced hosted charges are based on the number of contacts handled, while our on-premise solution is innovatively priced on a capacity basis. Brief overview of product: The Noble Solution provides a ‘total solution’ in Unified Communications, Business Process Management and Analytics offering a unified suite of multi-channel inbound, outbound and blended contact processing, strategy planning, and resource management tools for companies of all sizes. By integrating with existing systems for a seamless solution, without requiring an investment in time and money to rebuild processes or transfer data, our clients enjoy the benefits of increased productivity and reduced costs in a very short time frame. Some of the key differentiators of the Noble Solution are: • Single, Unified Platform and Long-term Stability – The Noble Solution was founded in 1985 and the founder is still the CEO today. Our components for inbound and outbound management, digital recording, desktop, universal queue, IVR, text-to-speech, WFM and analytics are integrated to work in a single, unified platform. Noble provides a complete and robust contact centre portfolio of solutions designed to continuously measure, improve and align operational performance. Flexible Solution Tailored to Client Needs – The Noble Solution is designed as a turn-key or point solution to integrate into their existing enterprise systems. We offer a variety of deployment options, including local and distributed environments, as well as Premise, Cloud and Hybrid platforms. Quality Client Support – The Noble CARE support team is based in Manchester, in the same building as our training, engineering, sales and service teams. Our clients have access to a team with over 500 man-years of experience in the contact centre business, as well as in Noble. Release details: Noble Systems distributes major vendor updates generally once in each 9-12 month period. However, system enhancements are released periodically throughout the year as new customisations or features are added to the solution. The majority of our product enhancements are the result of client requests for new features. Our Select Noble Users Group (SNUG) offers clients the opportunity for ongoing client education and networking. Typical customers: Banking and financial institutions, collection agencies, consumer products, fundraising, healthcare, home improvement, home services, magazines and newspapers, market research, mortgage companies, outsourcers and telecommunications. Typical price for a 100 agent solution: The Solution is bespoke to the individual client. Brief overview of product: CallScripter’s agent scripting software is helping contact centres of all sizes to achieve operational excellence by increasing customer satisfaction metrics, ensuring regulatory compliance and maximising agent productivity. CallScripter is business-process driven, flexible and easy-to-use. The software solution, which consist of core modules such as Agent Desktop, Script Editor, Campaign Management and Reporting allow contact centres to rapidly develop, deploy and analyse complex campaigns whilst supporting open standards for ease of integration to third party applications and telephony platforms. The unified agent desktop enables scripts to start upon presentation of an inbound or outbound customer interaction and allows crucial data to flow into the scripts giving agents access to relevant customer information and advice in real-time. Via intelligent workflow algorithms, full audits are maintained, enabling complete visibility and transparency regarding agents’ transactions and their KPIs. CallScripter is telephony platform agnostic, logical, easy-to-learn and aimed squarely at business users. The software is designed for a non-technical user in order to set up scripts, business processes and campaigns quickly and easily. The application is intuitive and flexible that can be tailored to any industry to help them become more effective, efficient and profitable. The application was developed as a result of a need from our own in-house contact centre, which helps the software division to truly understand the challenges, needs and requirements of modern contact and customer service centres. 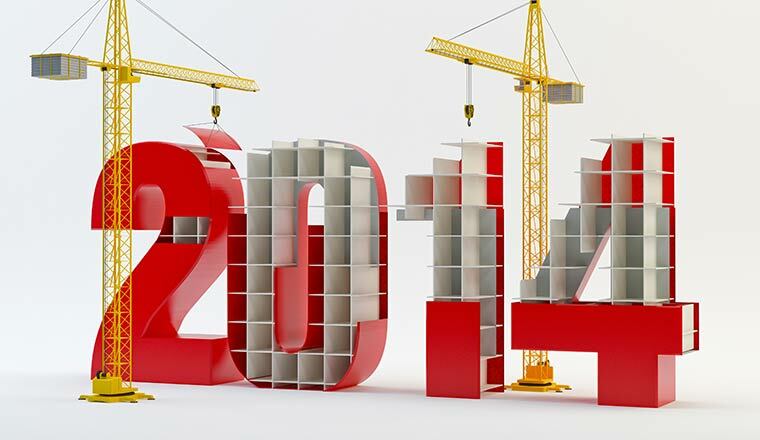 Typical customers: Finance, outsourcing and telemarketing, telecommunications, technology, charity, construction . Brief overview of product: Enabling TPS Compliant with Nexbridge guarantees that any phone calls your call centre is making will not reach a customer registered with TPS or CPTS. This is because TPS Compliant is operated at network level, in real time. Even if a call centre’s data has not been recently cleansed or if agents choose to manually dial TPS registered numbers, TPS Compliant will ensure you stay on the right side of the law. TPS Compliant is updated daily to ensure we are up to date and you are 100% compliant on any calls made from your organisation through our network. TPS Compliant works in real time and is fully automated. As a call is attempted we check the dialled number against our internal TPS/CTPS customer database ensuring if the number exists within this database it is blocked before a call is attempted. Typical customers: Call Centres (of all sizes) and Enterprise Customers. Typical price for a 100 agent solution: £100 per month based on 1 million calls per month (TPS Compliant is charged on a usage basis and heavily discounted for volume). Brief overview of product: Nexidia Interaction Analytics combines critical and comprehensive analysis capabilities with a robust performance management solution. This powerful combination puts business intelligence behind all your customer interactions, including calls, emails, chat messages, surveys and social media interactions too. It lets you get to the root causes of the issues affecting your customers and more importantly, have enough information to take action. The issues may range from product quality to an ineffective business process to a performance gap that requires additional agent training. By using analytics to drive operational and behavioral change down to the agent level, you’re assured to generate results for the people that deserve it most – your customers. Nexidia’s patented phonetic search technology enables businesses and users to take advantage of opportunities never before possible. Nexidia’s approach delivers significant advantages over other search technologies and methodologies. And because our technologies integrate easily into your existing infrastructure with the lowest total cost of ownership of any audio search solution, you can begin capturing the value hidden in your unstructured audio and video recordings in just days—not weeks or months. Maximum Scalability: Compared to the speech-to-text engines used by nearly all other speech technology vendors, Nexidia’s phonetic indexing and search approach provides far greater scalability in the amount of audio and video that can be made searchable. Nexidia enables you to handle large content sets quickly and get to work on it immediately. Highest Accuracy: Nexidia’s phonetic indexing process creates the most accurate index possible for any spoken content. Because no subjective decisions need to be made to translate content into text, all the original spoken content is retained in the indexes and, therefore, no error is introduced into the process. And because Nexidia indexes 100% of the content, every second is always immediately searchable. Flexibility: Nexidia’s experience enables us to handle all types of audio qualities, accents, and formats with ease. We currently support 35 different languages around the world, and can accept audio and video input and meta-data from practically any type of recording platform. Typical customers: bSkyb, Talk Talk, BT, Barclays, Experian, Cabot. Brief overview of product: rostrvm is a comprehensive suite of customer contact functions including multichannel inbound and outbound contact delivery, agent support tools with scripting and process support, management analytics and recording. rostrvm customer contact solutions have been developed and enhanced over a near-30 years. In that time we have worked closely with UK customers to accommodate their ever changing and increasing customer service expectations. rostrvm 9 builds upon that experience and specific real-world client feedback to provide a platform that supports the call centre transformation into a customer service hub. Typical customers: Customers include Autonet Insurance, Vodafone, EDF Energy, London Borough of Wandsworth, and Nottinghamshire County Council. Brief overview of product: EurekaLive is a real-time call center quality assurance solution that monitors in-progress calls for the presence or absence of specific language or acoustic characteristics. Designed to provide real-time actionable information to supervisors, quality analysts, and agents, EurekaLive is customizable to address a wide spectrum of business needs. EurekaLive consists of two parts: a supervisor dashboard (Command Post) for supervisors and analysts, and an agent assistant that sits directly on the agent desktop. The EurekaLive Command Post automatically monitors in-progress calls for language and acoustic characteristics, such as escalation attempts, churn language, profanity, compliance scripts, or high emotion. In addition, the EurekaLive Command Post leverages contextual language patterns – not just simple word spots – for increased accuracy and unlimited customization. It also provides the full text of audio snippets and instant playback for quick and easy problem evaluation, and uses high-fidelity audio capture which provides excellent accuracy and speaker separated audio. The EurekaLive Agent Assistant offers script compliance monitoring, emotion detection, next-best-action guidance and event alerting directly to agents, all based off of the live conversation that is taking place. The Agent Assistant can be configured to show fully customizable guidance and alerts based on a variety of business scenarios. Agents are provided next-best-action guidance in the form of links to relevant information or advice when certain items of interest occur on the call, for example: a technical issue with a product or a specific objection to an agent offer. Typical customers: Any corporation concerned with compliance, customer retention/service, and sales.